Discrete Mathematics provides a common forum for significant research in many areas of discrete mathematics and combinatorics. Among the fields covered by Discrete Mathematics are graph and hypergraph theory, enumeration, coding theory, block designs, the combinatorics of partially ordered sets, extremal set theory, matroid theory, algebraic combinatorics, discrete geometry, matrices, and discrete probability theory. Items in the journal include research articles (Contributions or Notes, depending on length) and survey/expository articles (Perspectives). Efforts are made to process the submission of Notes (short articles) quickly. The Perspectives section features expository articles accessible to a broad audience that cast new light or present unifying points of view on well-known or insufficiently-known topics. 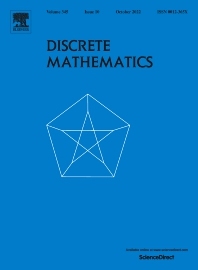 Discrete Mathematics also publishes occasional Special Issues containing selected papers, often from a particular conference. Such issues are fully refereed and adhere to the normal high standards of the journal.